This learning initiative was aimed at improving the understanding of objectives and features of multi-year budgeting, explaining the role of fiscal rules on the way towards establishment of well-functioning medium-term budget frameworks (MTBFs), and identifying the challenges and bottlenecks in its development and improvement. The workshop discussed practical models for building MTBF from a top-down perspective while also examining the relevant international experiences and how they can be utilized in moving forward budgetary reforms in SEE countries. Even though in most countries budgets are prepared on annual basis, today’s expenditure allocations usually have medium to long-term implications. For example, the outcomes of new spending initiatives are often visible only after the budget year in which they are taken. Similarly, the events expected to occur in few years may call for action today. This realization has instigated many countries to introduce MTBFs which imply that forward expenditure ceilings are defined at the beginning of the budget process and are anchored on the macro-economic and revenue forecasts, costs of current (baseline estimates) and new spending initiatives, fiscal rules, and fiscal consequences of revenue scenarios. Besides looking at the different concepts of MTBFs, this learning initiative described the potential benefits a well-designed and well-managed MTBF may bring- improved fiscal discipline and control, allocative efficiency and cost-effectiveness of service delivery, greater predictability in budget allocation, increased comprehensiveness of budget information and enhanced accountability and transparency in the use of resources. During this learning initiative we explained which features of the framework needed to be clarified when introducing or strengthening the MTBF, especially whether the framework will be fixed or flexible, how to anchor it in fiscal rules, how to set the constrains at the budget revenue side, and define the coverage of the framework. Moreover, at this learning initiative we discussed how to avoid frequent mistakes that may disable introduction of MTBF and/or make it a process that brings little practical value and is disconnect from the annual budget preparation. In particular, we assessed how to motivate budget users to regard expenditure ceilings as binding; how to improve coordination between national or sectorial strategies and budgets; how to effectively integrate MTBF into the annual budget preparation process, etc. Finally, this learning initiative explained the principles of medium-term budgeting, discuss main challenges and bottlenecks in their implementation, and describe practical models for building MTBFs from a top-down perspective throughout examination of the relevant international experiences and prospects for their utilization in moving forward budgetary reforms in SEE countries. Elaborate the implementation challenges and factors that are necessary to make medium-term budgeting work in practice. 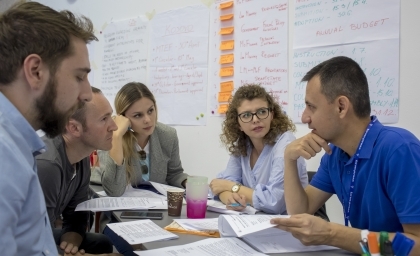 Since the learning initiative was designed as partaking, the participants were actively engaged in discussions and group exercises, and encouraged to share their country’s experiences and challenges encountered in budget preparation process. It provided a ground for sharing experiences and best practices between participants and thematic experts from the SEE region, and beyond. Public officials from the CEF Constituency countries and the other SEE countries were welcome to apply. Invited were those officials who are working at ministries of finance, line ministries (and other budget beneficiaries) who actively deal with budget preparation, strategic planning, macro-economic forecasting, and budget decision-making. The applications from individuals who are not public officials were considered according to the space availability. The event was delivered in English and no translation was provided. No fee was charged, and lunches and refreshments were provided for all selected participants. The applicants needed to obtain funding from their sending institution or other donor(s) to cover visa, travel, accommodation, and meals costs. Applications deadline was October 25.